Last Friday I judged Blue Mars' Monster Ball costume contest, and I was really impressed with the creativity I saw in the costumes worn. I wanted to take the opportunity today to shine the spotlight on a few of these awesome outfits as a final send off for one of my favourite holidays. The four avatars above are each winners of the Monster Ball costume contest, and the competition was fierce. 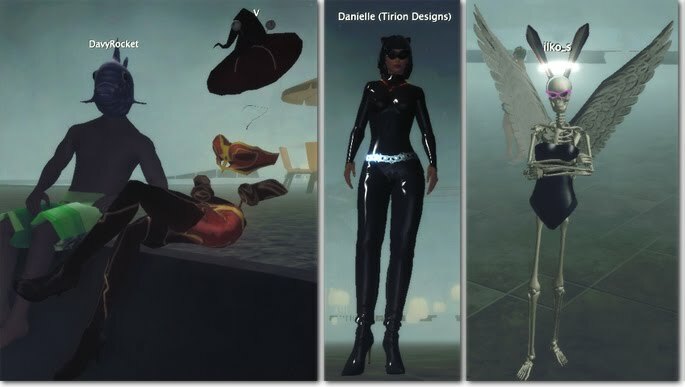 From left to right we have DavyRocket and his beach-ready fish-man ensemble, V in her invisible mage armor, Danielle in a catwoman outfit worthy of Eartha Kitt and Julie Newmar, and finally ilko_s as a bunny-girl skeleton angel (...with sunglasses!) who the crowd unanimously agreed could probably use a sandwich or two. ilko wasn't the only Martian fashionista sporting a bare-bones avatar. Aether pulls off a similarly haunting style, though where ilko's avatar is amusing, Aether's is truly ghoulish. Another honorable mention goes to Liza Chen for her fiery brocade kimono, which was a luminous and strikingly unique look on the dance floor! If you're wondering was I wore to the party, check out my costume breakdown from last Friday, and if you've missed any of our coverage of Halloween in Blue Mars, you can catch up here! 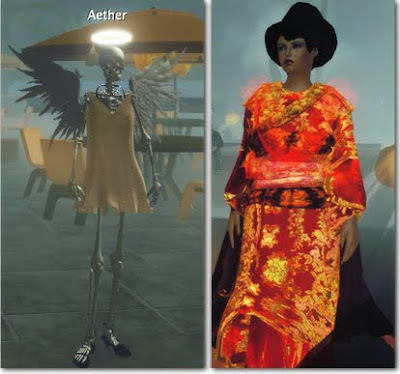 Don't let spooky style tips feel seasonal -- in a virtual world, every day can be Halloween!